Expats in Spain Tenerife, such as Laura and family. Find all sorts of expats in Spain's Tenerife. . The British alone amount to 45 000 on the biggest of all Canary Islands. Some are retirees, others are young and are still working. Laura, who is a writer who works from home is one such happy island dweller. Why is she happy there? Well, you will learn all about it just now. First of all, Tenerife Island is not a normal island but, has much to offer. Many of its foreign immigrants include Russians, Ukrainians, Frenchmen, Italians and of course nations from further up north of Europe. Other nations feature less on the island. 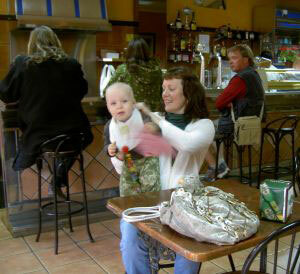 Shown beside are Laura with ravishing baby Tommy expats in Spain from the UK. Her husband the man in black who only has one leg sits by the bar. His disability, certainly, will not let him work. The bistro which you see is a much frequented meeting place by expats in Tenerife Spain. Laura's father in law was the reason why they moved there. The elderly gentleman came for a holiday once, and stayed. He doesn't want to return to the UK after many years of overseas retirement in Tenerife, although, he isn't perfectly well, now. Surgery in Tenerife by one of expats in Spain. Laura's father in law had surgery. He is now staying at a retirement home with special car. By now, he is doing very well. He seems to be totally cured from his illness. Laura and husband often go see the 'old man' or they pick him up for outings. Baby Tommy stays sometimes in his nursery school for toddlers, although, grand dad is, of course, always, happy to see him. I only know Laura and her husband casually. To my knowledge they are renting an apartment on the roofs in one of the modern townhouses in Calle Jasmin La Longuera of Los Realejos. They are happy expats in Spain. Asking them how they cope financially would not be appropriate for me. What counts is that I see hubby's smiling face, often, when going into town and he, expressively, told me how fortunate he is to be one of expats in Spain in Tenerife. When we talk it's about general things like the baby, the property situation, the island and the warm and welcoming locals. The expat with one leg said that the island will be so much better for his son to grow up than England. Don't all expats in Spain think that the grass is greener, once they left home? He believes conditions on the island will improve for his family and all expats because, less people will be able to afford frequent travels to it. Laura is, of course, also very content to live in Tenerife. But, that might also be due to having a lovely baby without a for ever running nose - far from European winters. Soon, little Tommy will be big enough to amuse himself by nearby Playa Jardin or sheltered Playa San Marcos which is only about 35 minutes drive from Los Realejos. The expats parents can soon take toddler Tommy to one of Teide excursions, more of which learn here... There little Tommy can get crazy with joy playing with snow, in winter or spring. Once older, Tommy can go by himself on the bus to the Puerto Cruz end of town beach Martianez. to surf. I know another, but retired British couple who are long time relocaters in Spain Tenerife North. I often see them on the bus with a Spanish guitar when they take their gifted grand daughter for music classes in Puerto de la Cruz. This shows that the life of expats with children and family is never boring in Tenerife. Of course, there are many British expats without children, such as Angus, who lives also at Davida now which is the same retirement home Laura's father in law loves so much. Expats in Spain life stories about Tenerife?